Repeatedly throughout Creed II, Adonis (Michael B. Jordan) is directly asked by Rocky (Sylvester Stallone) why he has to fight. To continue spiritually connecting with his dead father as he did in the first Creed or possibly now to avenge him? For honor? To win some belt? To prove naysayers wrong? Because he doesn’t know how to do anything else? Adonis takes the entire film to arrive at a good answer. It’s a question, however, Creed II could be asking of itself. Why does this film even exist, at least outside of obvious economic incentives? The reason for Creed to exist was personal: as a child, Ryan Coogler bonded with his dad over the Rocky movies, and as an adult when his dad got sick they again bonded over Rocky, the two of them preferring Apollo to the Italian Stallion of course. 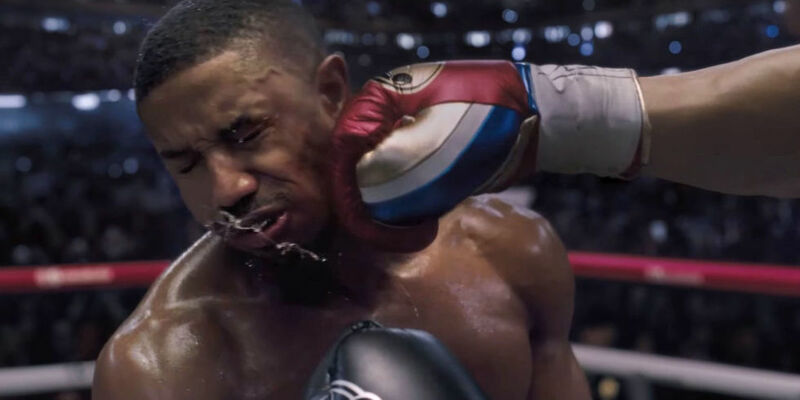 So, Coogler made Creed as a tribute to his dad and used pulse-pounding long shots, well-drawn new characters, and a career-best Stallone performance to bring vitality back to a film series which had become a punchline. Coogler has since moved on to some place called Wakanda. Stallone has regained creative control of the franchise, co-writing the script this time and making plenty of noise about wanting to direct as well before stepping aside for Steven Caple Jr., a newcomer with one film to his name, 2016’s inner city youth drama The Land. Michael B. Jordan and Tessa Thompson are back as Adonis and Bianca, aka, Rocky and Adrian 2.0. However, the sense of narrative urgency is missing. Ryan Coogler directed Creed as if he’d just been shot out of a cannon, redefining the way boxing should be filmed and setting the bar for how to both update and honor what came before. Caple Jr., however, proves to be a very different kind of director, more drawn to slow, drawn-out conversations scenes and workmanlike with the boxing/training scenes. Don’t go in expecting any repeat of Coogler’s infamous oners from Creed. Caple Jr. doesn’t even try, choosing to instead film boxing matches just like most other movies ever have, albeit with a couple of Rocky IV homage super-slow-mo fists to the face. So, if the actual boxing in this boxing movie is a bit lacking (despite the truly impressive physiques on display) does the drama at least carry the day? Almost. The plot this time: Creed vs. Drago, Round II. Adonis vs. Viktor with Rocky and Ivan in their respective corners. Adonis is now the Heavyweight Champion, but he doesn’t feel like it. There’s something missing in his life and even proposing to Bianca can’t totally fix it. Along comes beast-like Viktor Drago (Florian Munteanu), son to the man (Dolph Lundgren’s Ivan) who killed Apollo in the ring, and his demands for a title bout. Against Rocky’s advice, Adonis agrees to fight Viktor in order to avenge his dad but soon learns what it’s like when the roles are reversed and you’re no longer the young, hungry challenger with nothing to lose. Creed II is even more of a direct sequel to Rocky IV than Creed was. Rock IV, obviously, is one of the best cheesy sports movies of all times. Oh, there are far better straightforward sports movies, even within the boxing genre, like Raging Bull or even the first Rocky. But if you want just pure cheese, Rocky IV has few peers. It’s a movie with too many montages to count and Sylvester Stallone using his fists and marble-mouthed words to improbably topple not just a flat-topped Russian but also the entire Cold War. The transfer from the camp of Rocky IV to the gritty drama of Creed II isn’t as awkward as it could be. Lundgren finally gets to turn Ivan Drago into an actual character and not just a physical specimen with a propensity for heartless one-liners. The final fight of Rocky IV, we learn, was the worst night of his life, leading to him being driven out of Russia and stuck raising a son the mother didn’t want due to the stink of the Drago name. Now living in the slums of Ukraine, Ivan ruthlessly molds Viktor into a revenge machine, but as their scheme hatched with boxing promoter Buddy Marcelle (a seriously underused Russell Hornsby) to force a fight with Creed comes to fruition both Ivan and Viktor have to grapple with whether gaining re-acceptance into Russia through boxing victories is something they actually want. So, Creed II is certainly aiming to be a nuanced story about family, particularly fathers and sons. Adonis is still grappling with his father’s memory and his new need to start a family of his own. Rocky, healthy again after his cancer scare, is realizing how little time he has left and why he needs to at least try to reconnect with his actual son. Ivan is trying to use his son to repair his legacy. This results in an incredibly effective finale in which all three of these couplets come to an emotional catharsis. It was enough to make me walk out of the theater thinking Creed II finally found its purpose. It just takes a while to get there. A slower, more contemplative sequel which lacks the urgency of a Ryan Coogler movie but gets enough right to pull you in. Music Score Spoiler: Just like the first Creed, Creed II pulls the trick of holding back on the iconic Rocky musical score until the most triumphant moment of the final fight. It’s not nearly as effective here, but, I can’t help it, that music combined with sports achievement on screen still gets me. Phylicia Rashad, playing Creed’s mom, has much more to do this time around.